Trova il tuo Zen interno con il Chi. Il successo ottenuto con gli Ultrabook Zenbook e con i tablet Transformer ha portato Asus a creare una nuova famiglia di convertibili Transformer Book chiamati Chi. Il T300 Chi è il più potente di tutti e con il suo schermo 2560 x 1440 ci ha impressionati. Per la versione top di gamma invece si superano i 1000€ ma a quel punto il nostro consiglio è di puntare su soluzioni molto più solide in tutto dalle prestazioni, al calore emesso e all’autonomia come il Surface Pro 3 di Microsoft che nonostante abbia già un anno di commercializzazione sulle spalle risulta ancora una delle migliori scelte in fatto di 2-in-1 premium. The ASUS Transformer Book T300 measures 31x19x1cm, the last figure varies from .8cm at the front edge to 1.4cm at the back edge. It weights 1425grams all these figures assume you use the unit as a notebook. This is the first unit I have reviewed that was supplied with Windows 10 pre-installed. Had the Transformer Book Chi T300 squeezed in even one full-size USB port, its power, portability and reasonable price tag would have made it an outstanding laptop alternative. Instead, it will have to settle for being just a really rather good convertible. Even with the limited connectivity options and relatively brief battery life, the almost ultrabook-level performance, brilliant display and featherweight design of this 2-in-1 make it one of the most attractive hybrid devices around. The T300 Chi does come with a £799.99 price tag however, which would suggest you certainly pay for the added functionality of a 2-in-1 Transformer Book. Still, if you are in the market for a hybrid laptop, this one seems like a good bet, and you will not be disappointed. There is a cheaper option at £669.99 – but that has less RAM and a slower Core M CPU, so we’d recommend shelling out the extra £120 for the additional performance gain. The Asus Transformer Book T300 Chi has several great features, such as its gorgeous design and high resolution screen, although battery life was disappointing and connectivity is only average. Unless portability is your absolute priority, the thicker Microsoft's Surface 3 is a better pick, it has a full-size USB3 port and much better battery life. Even with the optional touch cover on top, it's cheaper than the T300 as well. If like me, you have all your music and video files saved on external storage and in the cloud and you plumb into a USB hub every day as a matter of course, then the T300’s compromises in these areas shouldn’t present much of a problem. Indeed, this may be the first tablet-laptop combo I’ve tried that I could actually live with as a tablet and a laptop. It seems Asus is still the daddy of convergent devices. The Asus Transformer Book Chi T300 is a great looking hybrid laptop that packs in an incredible screen and capable performance for around £670, but its short battery life, unwieldy size, lack of full laptop features and awkward keyboard make stop it short of greatness. If you're after a hybrid, convertible hybrid though, its smaller T100 sibling is well worth a look. The Transformer Book T300 Chi is a competent hybrid. The display is superb, the design attractive; this is a hybrid that performs well in both tablet and laptop roles. There’s room for improvement – but, for the money, its flaws are ones we could live with. If you’ve been looking for an affordable, more flexible alternative to the Microsoft Surface Pro 3, the Asus Transformer Book Chi T300 is worth considering. At the end of the day though, it really depends what functionality you value most. There are ultrabooks out there for a similar price as the Chi T300 that offer better battery life and possibility even greater performance. However, these machines may not offer you the flexibility and usage modes that the Chi T300 offers, and that’s where this machine really shines. 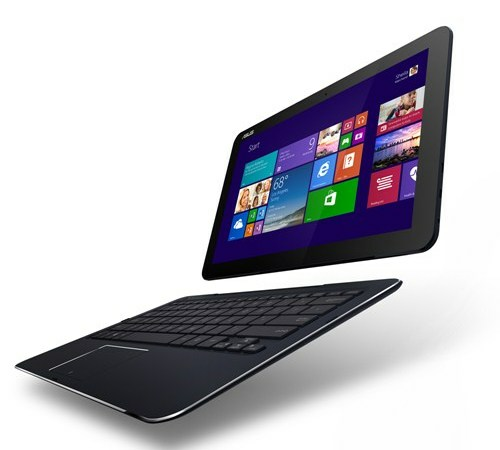 The Asus Transformer Book T300 Chi is a stylish, powerful detachable-hybrid tablet. The system's balanced clamshell mode and slim design will bring it some fans, as will its performance, which is closer to a Core i5 CPU than an Atom processor. However, the dongle situation, somewhat short battery life, and a price tag that's high for its category are flaws we can't ignore. The Bluetooth keyboard could cause problems for airline passengers who use Airplane mode on flights, and the fact that you have to recharge the keyboard separately can leave you in the lurch if you forget to do so. The Asus Transformer Book Chi T300 is an intriguing and stylish take on the Windows laptop hybrid. However, poor battery life, some issues with the screen and some fundamental problems with the whole 2-in-1 design approach means it falls well short of convincing as either a tablet, a laptop or something in between. The choice between the two T300 models is easy. It's nice that the $899 model has a 2560 x 1440p quad-HD screen, but it costs $200 more than the base model and has just 5.5 hours of battery life. The $699 T300 Chi has a slower CPU, but it's still fast enough for typical use and retains all of the other features that make the new Transformer Books so great: a lovely aluminum chassis, a bright touch screen and a full-size detachable keyboard. There’s room for improvement – the battery life, miniaturised ports and slow SSD all take their toll – but, for the money, those are flaws we could live with. If you’ve been looking for a more affordable, more flexible alternative to the Surface Pro 3, the Asus Transformer Book T300 Chi is well worth considering. We like the neatness of the T300 Chi’s design, and the fact that it’s so easy to turn from a notebook into a tablet and back into a notebook. It depicts both devices quite well, especially if you aren’t running any demanding tasks, and the build quality is high so that each device scenario feels assuredly solid. Asus's CHI T300 is a device that will turn heads, grace to its looks and svelte silhouette. It's not just a looker though, is also surprisingly fast in everyday use for a fanless Core M powered machine, packs a good display and is bundled with one of the best keyboards I've tested on thin devices lately. If only it wouldn't run out of juice so fast. Обзор ASUS T300 Chi: зачем нужны гибриды? Обзор ASUS Transformer Book T300 Chi: ноутбук или планшет? Scheda grafica integrata (GT2) nei processori Core M della Broadwell Y-series (4.5 W TDP). Processore ULV dual-core Broadwell-based per tablets e notebooks 2-in-1. Offre una GPU HD Graphics 5300 integrata ed è realizzato in 14 nm.